Turn the lights back on now. No heroes, villains, one to blame. While wilted roses fill the stage. Our debut was a masterpiece. But in the end for you and me. Oh, the show, it can't go on. We used to have it all, but now's our curtain call. So hold for the applause, oh. And wave out to the crowd, and take our final bow. Oh, it's our time to go, but at least we stole the show. At least we stole the show. You know that we are sold out. This is fading, but the band plays on now. So let the velvet roll down, down. Our lines we read so perfectly. But the show, it can't go on. 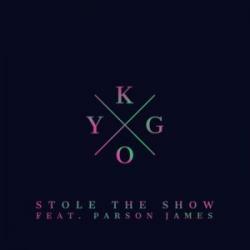 STOLE THE SHOW ( FT. PARSON JAMES) es una canción de Kygo del año 2015. La letra ha sido escrita por MICHAEL HARWOOD, MARLI HARWOOD, KYLE KELSO, ASHLEY PARSON, KYRRE GOERVELL-DAHLL.